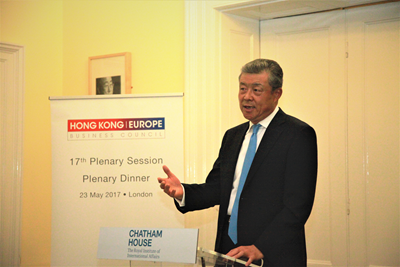 On May 23, Ambassador Liu Xiaoming was invited to attend the Hong Kong-Europe Business Council Dinner at the Chatham House and delivered a keynote speech entitled Commitment, Constancy and Confidence. 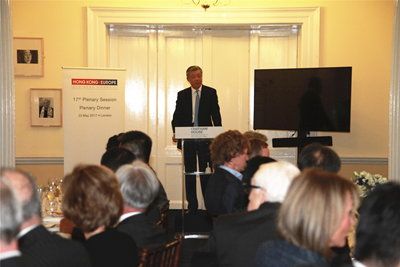 This event was co-hosted by Hong Kong-Europe Business Council and Hong Kong Trade Development Council (HKTDC). Nearly 40 people including Chairman of First Eastern Investment Group Victor Chu, Deutsche Bank Chairman Paul Achleitner, HKTDC Executive Director Margaret Fong, Member of the Executive Council of Hong Kong Laura Cha, Financial Times Editor Lionel Barber, Deputy Director of Chatham House Adam Ward, representatives of Hong Hong and European entrepreneurs and British academia, and HKTDC officials, were present at the event. Ambassador Liu first extended his deep condolences to the victims of the bomb explosion in Manchester and heartfelt sympathies to the injured and the bereaved families. 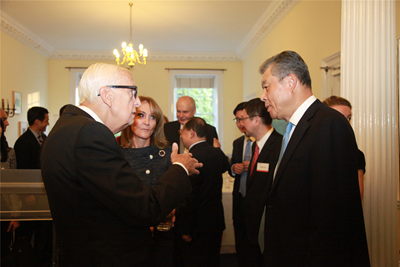 He stressed that at this time of difficulties, the Chinese people stand firmly together with the British people. In his speech, Ambassador Liu recalled the great achievements that Kong Kong has achieved since its return to China, and emphasised the successful "One Country Two Systems" in the past 20 years. The Central Government of China has consistently and strictly adhered to the Constitution and the Basic Law and has been firmly committed to the "One Country Two Systems", "Hong Kong people governing Hong Kong" and "high degree of autonomy", which has been the fundamental guarantee for Hong Kong's continued prosperity and stability. Today, Hong Kong continues to be a key global centre of shipping, finance and trade and remains one of the world's most competitive economies in the world. And the past twenty years have witnessed the steady advance of rule-based democratic governance in Hong Kong, and the Hong Kong people have enjoyed unprecedented democratic rights and greater freedom than ever before in their history. Ambassador Liu noted that there are great opportunities for Hong Kong to participate in the Belt and Road building. First, by leveraging its status as a leading global financial centre, Hong Kong has a role to play in advancing RMB internationalization, building the Belt and Road financing platform, and enhancing its position as the world's offshore RMB hub. Second, with its unique and advantageous location in the Guangdong-Hong Kong-Macau bay area, Hong Kong could become a multiple-service centre for projects along the Maritime Silk Road and provide comprehensive services for the Belt and Road building. Third, aiming to enhance cultural bond and mutual understanding, Hong Kong could focus on cultural and educational cooperation with countries along the routes and turn itself into a magnet for high-end R&D industries and talents. Ambassador Liu listed four reasons for his confidence in a promising future for Hong Kong: the Chinese Central Government's unremitting support for Hong Kong, the development opportunities brought by the Belt and Road Initiative, the deepening of the "Golden Era" of China-UK relations, and Hong Kong's "Lion Rock Spirit". The Ambassador stressed that whatever difficulties lie ahead, a promising future for Hong Kong will be created as long as China's mainland and Hong Kong work together to remain true to our shared commitments to Hong Kong's prosperity and stability, constancy to uphold the "One Country Two Systems" policy, and confidence in Hong Kong's future. He expressed the hope that Hong Kong would seize the opportunities and ride on the momentum of China-UK ties to achieve its own goal of further development and leverage its role as a bridge to contribute more positive energy to China-UK relations. After the speech, Ambassador Liu answered the questions raised by the audience on the prospect of China-UK free trade agreement, the potential of economic and trade cooperation, China-US relations and other issues. Hong Kong-Europe Business Council, founded in 1997, serves as an important channel for high-level dialogues between business leaders in Hong Kong and Europe. It aims to enhance understanding and cooperation between the two business communities, strengthen business connections and information exchanges, and create a positive environment for the trade and investment of enterprises in Hong Kong and Europe. The council is co-chaired, and the present co-chairs are Chairman Victor Chu of First Eastern Investment Group and Chairman Paul Achleitner of Deutsche Bank. Its members are from manufacturing, trade and services sectors in Hong Kong and Europe, including Financial Services Development Council of Hong Kong, Polaris, Fung Seng Enterprises Holdings Ltd., Santander, Siemens, Rothschild and Allianz. The Business Council holds a plenary meeting once a year in Hong Kong and Europe alternately, with its secretariat in HKTDC.